There was once a big family living at the foot of Mount Tajam (Gunung Tajam). The climate was warm and rainy and the land was fertile. They got up early and grew vegetables in the garden or went fishing by the river. They took their rest at the riverbank and sang joyfully at sunset. After dinner, the children sat in front of the house and told stories to one another. They lived happily and undisturbed. Tuk Burod was one of the sons in law who was very lazy. He didn’t work and often went to seek pleasure. He liked alcoholic drinks and slept after he got drunk. His father in law was quite upset and advised him to be more diligent. Tuk Burod didn’t take any notice of what the old man said. It seemed that it was too hard for him to change his bad habit. While the dry season was getting closer to its end, the villagers began cutting trees in the forest for planting rice in the rainy season. The old man divided the areas equally. Each of his sons in law got two hectares and should be well cultivated not later than half a month. While the others were working hard, Tuk Burod sat and ate his cassava without doing anything. Afterwards, he slept like a log in his tent. His father in law was very angry and told him to start his work as soon as possible. Tuk Burod said he wanted to finish eating his cassava before he got ready. After a while, he took his chopping knife to the forest. He said to his knife: “Oh, my dear knife! Please cut all the trees for me when I swing you three times.” The miracle happened at the very moment. All the trees were cut and fell on the ground. The farmers let the woods dry in the sun within a week, and then they burned them to make the soil fertile. Tuk Burod slept all the time and didn’t do his work. Nobody dared to disturb him. He woke up in the afternoon and went home together with the family members. Tuk Burod hadn’t burned his woods when it was time to hole the field for seeding. As he was blamed for his laziness, he told his father in law not to worry about. He promised to complete all his work the following day. It was raining cats and dogs the next day. The old man asked his lazy son in law how he could set fire in the heavy rain. Tuk Burod said he would show him after breakfast. Tuk Burod then went to cut down a young banana tree behind the house and put it over a burning stove. The banana tree flared as if it were a torch. He set fire to the wet woods and burned all of them. The fire was so strong which caused the soil to be badly burned, so it was unsuitable for the seeds. His father in law was very sad, but there was nothing he could do. Tuk Burod was sorry for all that he had done. He changed his bad habit and became a good man. 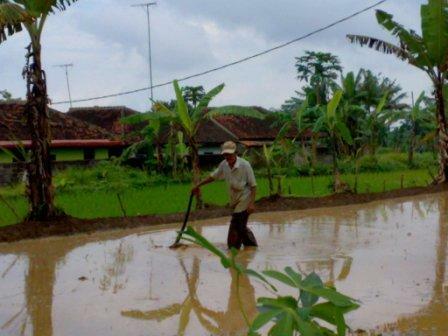 He often helped farmers cut trees and cultivate their rice fields and make them more fertile. All the paddy fields which had been cultivated by him became highly productive. He offered his help to the poor free of charge. He just got a few pieces of rice crust for his payment. This is a very popular tale in Belitung and it is well liked by children.